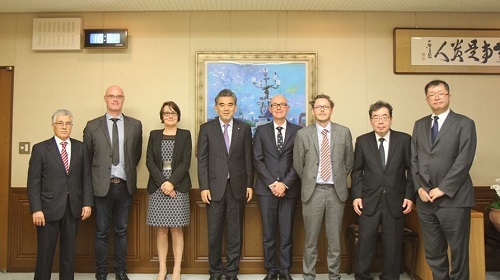 On December 4th 2018, First Vice-President Loic Levoyer and Vice-President Emmanuel Aubin (Social Relations, Legal Affairs and Ethics) from Poitiers University in France, as well as Law Faculty Dean Nathalie Albert and Professor Pierre=Yves Monjal from Tours University in France, visited Hiroshima University (HU) and paid a courtesy visit to President Mitsuo Ochi. HU’s Graduate School of Social Sciences has concluded a departmental exchange agreement with Tours University in 2015. Poitiers University is located near Tours University and the two universities have built a mutually beneficial partnership over the years. 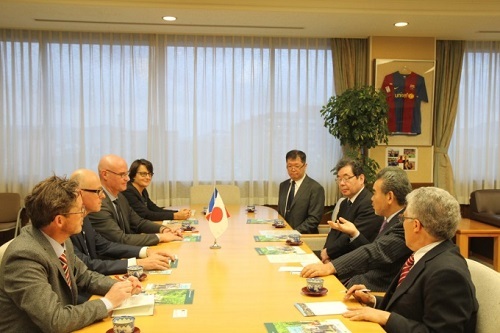 This time, we held a discussion with the delegation from Poitiers University towards concluding a departmental agreement in terms of social sciences. On the same day, Professor Monjal gave a lecture in front of a big audience consisted mainly of HU’s students and staff, followed by a lively exchange of views. With this visit as momentum, we hope that exchange between HU and these two French universities will be further promoted.